Front and rear dashboard cameras are also called dual-channel or dual-lens dash cams. Over recent years, there’s been a huge increase in quality of these devices. Modern dual-lens dash cams should be able to record 1920×1080 (1080p) video with both the front and rear channels. It’s finally time to say goodbye to those outdated, grainy 720p rear video feeds! We’ve compiled a table to give you an overview of the main characteristics of our six favorites. Click the links to jump right down to the more detailed descriptions. Screen 2" 1.5" - - 2" 1.5"
All prices listed are approximate, and subject to change. Click links to vendors below for up-to-date prices. First of all, all cameras featured here are able to record 1080p resolution (1920×1080), at 30 frames per second (fps), both to the front and to the rear. This should be considered the minimum standard in 2019. Cameras that record 720p, even if it’s only for the rear camera, just don’t capture enough detail. All dash cameras reviewed on this site have loop recording, auto on/off, and a time and date stamp on video. If they support GPS, there will also be an (optional) speed stamp that can be set to either mph or km/h. Furthermore, all cameras listed here have a G-sensor that detects impacts and protects the relevant video files from becoming overwritten. A “lock file button” does the same, but allows you to manually save any video footage that you’d like to keep for whatever reason. It’s good to see that lock file buttons now have become a standard feature in the dash cam world, as well. All dash cameras have a built-in microphone and speaker. And finally, all dual dash cameras that made it onto our best-of list support GPS, although it’s not always included with the base price. Some cameras require you to buy a separate GPS module if you want one. Released in January 2018, Street Guardian’s SG9663DC (full review) records better quality video than any other front and rear dash cam. While this is a high-end device, it also focuses on the basics, meaning video quality, usability, and reliability. Consequently, it doesn’t include features such as Wi-Fi or cloud connectivity. An external GPS antenna is included in the package, as well as a CPL filter. The camera’s 2″ screen and intuitive menus make it easy to set up and use this device. Also, Street Guardian’s customer service is well known to be very responsive and helpful in case you should have any problem or question. This camera comes with a capacitor instead of an internal battery, which improves heat resistance. A lock file button allows you to save important footage so it doesn’t become overwritten. The Street Guardian SG9663DC supports a relatively simple time-lapse parking mode. A hard-wiring kit named SGDCHW is required for this and costs around $30 (not included). The hard-wiring kit is needed to connect the dashboard camera to your car’s fuse box. It protects your car’s battery from becoming accidentally depleted when parking for a long period of time. NOTE: If you can’t afford the SG9663DC right now, you may want to check out the SGGCX2PRO, which is basically a single-channel version of the SG9663DC but without the rear camera. You can add the rear camera at a later time when your finances will allow it. This addition to the once-popular Chinese Mini series has been a full-out success. For those of us who can’t spend several hundred dollars on a high-end front and rear dash cam, the Mini 0906 (full review) is an excellent alternative. While it doesn’t record quite as high-quality video as some of its more expensive counterparts, this camera is a great entry-level front and rear camera. It comes with a CPL filter to reduce windshield reflections when driving in bright sunlight. A GPS receiver is integrated into the cameras mount. The Mini 0906 has a 1.5″ screen for easy configuration and playback. When hard-wired to the car’s fuse box, it supports a time-lapse parking mode. The hard-wiring kit is not included and costs only around $12 extra. A pro-level front and rear dash cam with a whole lot of extra features, and very good video quality all around. The F800 Pro (full review) offers no less than 3 different parking modes to protect your car while you’re away. This camera can also connect to the internet to alert you when something happens to your parked car, but remote video streaming is as yet not supported. This camera usually comes with a hard-wiring kit included. The camera’s firmware will sense when your car’s battery runs low and will protect it from becoming depleted. An overheat protection mechanism is also built-in that will shut the camera down if it ever becomes too hot. GPS is integrated in the camera. The F800 Pro has no screen, but it does support Wi-Fi so you can view video and configure the camera with your smart phone. Free apps are available for Android and iOS smart phones to connect to the camera and play back video. Playing back video over Wi-Fi tends to be slow though, so if you have to review several video files, it’s often more convenient to pop out the memory card and stick it into a computer. Features: Integrated GPS, Wi-Fi, buffered parking mode, cloud connectivity, capacitor, lock file button. Battery discharge prevention device available separately (Power Magic Pro). BlackVue’s dash cams have always been a best seller on this site, and their DR750S-2CH (full review) finally added 1080p resolution for the rear channel, as well as a much needed lock file button which BlackVue’s previous releases didn’t have. While the DR750S’s video quality isn’t quite as good as with some of the other cameras listed here, what really sets the BlackVue cameras apart is the ability to live-stream the video feed from your car over the internet, and watch it from anywhere on your PC or phone. For this to work, you’ll need a Wi-Fi hot spot in your car to give the camera permanent internet access. Portable hot spots are available separately (not included). Apps are available for iPhones and Androids to allow you to control to the camera with your phone. This camera doesn’t have a screen, but it does come with a voice menu for basic functions. A buffered parking mode is supported, but needs a Power Magic Pro to work. This is basically BlackVue’s trademarked hard-wiring kit — it monitors your car’s battery voltage in order to not deplete it. Some vendors include a Power Magic Pro with the camera, other’s don’t. It typically costs around $30 when ordered separately. In buffered parking mode, the dash cam will keep recording continuously while the car is parked, but without saving the footage on the memory card. Only when an event is detected will the footage be saved in a special folder. Upon your return to the car, the camera will announce that events have been detected so you will know that there are videos for you to review. 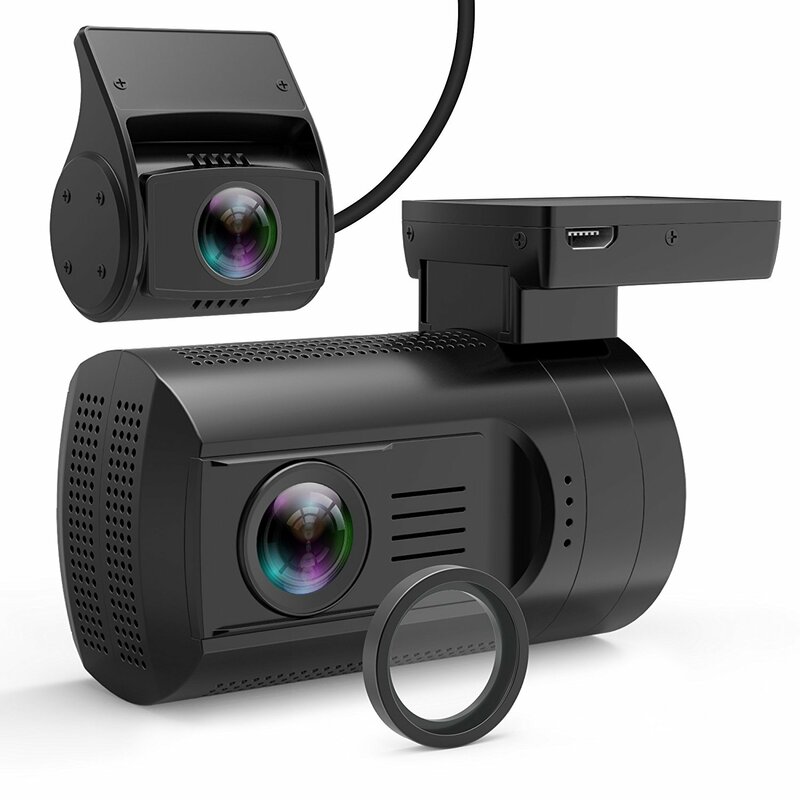 UPDATE (July 2018): BlackVue have recently released their DR900S-2CH model, which records 4K resolution front and 1080p rear. However, after comparing video quality we are confident that the DR750S actually performs better. Extras: 2″ screen, Wi-Fi, capacitor, lock file button, GPS in mount. Simple and time-lapse parking modes. Optional additional remote lock file button. Optional CPL filter. The Viofo A129 Duo was released in mid-2018, and it’s the most recent addition to our best-of list. It’s a bit more expensive than the Mini 0906, but it also records better video, and is more reliable. Check out the sample videos in our full review. With it’s wedge shape and black casing, the A129 is also quite stealthy. A GPS receiver is built into the camera’s mount. The A129 also supports simple and time-lapse parking modes if you get it with the corresponding hard-wiring kit. A CPL filter is available for the forward facing camera only. The camera has a lock file button (the round one with the yellow triangle on it), but if you find this inconvenient to reach while driving, Viofo also offer a remote lock file button that works via Bluetooth. You can place the remote button anywhere you like, near your steering wheel for example, so you don’t have to reach all the way over to the camera if something happens on the road that you’d like to keep video of. Features: 1.5″ screen, time-lapse parking mode, lock file button. Optional GPS in mount. The Vantrue N2 Pro (full review) has one lens looking back into the passenger cabin, while the forward facing lens records the road ahead. This is ideal for anyone in the transportation business, such as taxi or Uber drivers who wish to keep themselves safe on the road. If you’re going to do any driving at night, you’ll definitely need infrared lights on your taxi cam to illuminate the car’s interior. Make sure to get the Vantrue N2 Pro which has IR LEDs surrounding the rear-facing lens. DO NOT order the regular N2, which doesn’t have those LEDs. For the Vantrue N2 Pro, video quality of the car’s interior is very good, both at day and night. Video quality of the forward facing lens is good at day, and fair during the night. We do feel we should point out that we haven’t found a taxi cam yet that records great video both ways at this time. (Some people like to just get a high-quality dual cam like the Street Guardian and mount the rear-facing lens on the dashboard so it records the passenger cabin, but most “normal” dual dash cams don’t have infrared on the rear lens.) A real taxi cam is much more convenient, and the N2 Pro seems to be the best there is in 2019. A time-lapse parking mode is also available to protect your car while you’re away. As usual, a hard-wiring kit is needed for parking mode. This is not included and costs around $15 extra. The camera has a screen to review footage on the fly. You configure the camera using the buttons on the device (it doesn’t support Wi-Fi). GPS is not included, but is available separately if you need it. For around $20 you can acquire a spare mount that has the GPS antenna built in. To review the GPS data, you need to install Vantrue’s free playback software which is available for Windows and Mac, and review the footage on your computer. April 2019 Update — We’ve added the Viofo A129 Duo to this selection, expanding our best-of list to six front and rear dash cams. The best front and rear dash cams for 2019. Budget to high-end. All cameras featured here are highly reliable and record 1080p both ways.